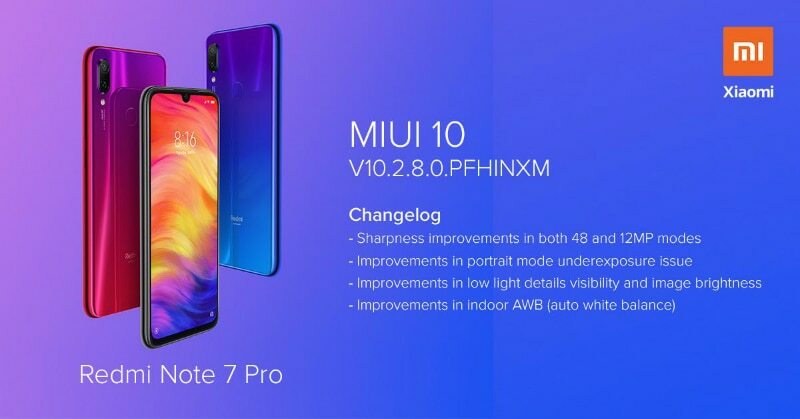 Redmi Note 7 Pro Phone, MIUI 10 Global Stable Update Reached A new update has been reached by phone MIUI V10.2.8.0.PFHINXM. Redmi Note 7 Pro adds some new features to the phone's camera. This update also improves image quality. With improvements to the camera, a new MIUI 10 update for the Redmi Note 7 Pro phone has been added to the March Android Android patch. Redmi Note 7 Pro was released in India in February. This phone started selling in March. The main attraction of the Redmi Note 7 Pro phone is the 48 megapixel rear camera and the Snapdragon 675 chipset. With the OTA update, updates are available on the Redmi Note 7 Pro phone in MIUI 10 Global Stable ROM V10.2.8.0.PFHINXM. I have already posted a link to this update on the MIUI Forum for Recovery Ram and Fastboot ROM Xiaomi. However, before the update, Xiaomi advised to back up the entire phone. This update provides several new features in the 48 megapixel and 12 megapixel modes of the Redmi Note 7 Pro phone camera. Also improved in Portrait mode. The low-light film also improved, Xiaomi said. In addition to camera improvements, some bugs have been fixed with new updates to the Redmi Note 7 Pro phone. We added the Android security patch in March. Redmi Note 7 Pro has a 6.3-inch FHD + display. Small notch above the display. The Snapdragon 675 chipset gives your phone up to 6GB of RAM and up to 128GB of storage space. Redmi Note 7 Pro has a dual camera for taking pictures. The 48 megapixel sensor remains in the primary camera. There is a 5-megapixel detective sensor. Xiaomi used a 13 megapixel camera to take the selfie. All cameras support artificial intelligence. The company's own MIUI 10 screen in the Android 9-pie operating system runs on the Red Meat 7 Pro phone. 4,000 mAh battery and fast charging support. 6GB + 128GB storage Redmi Note 7 Pro costs $ 16,999. In addition, 4Gb + 64GB storage capacity has Redi Note 7 Pro set to 13,999 taka. This smartphone can only be found on Flipkart and Mi.com.